With the AlphaBetter 20" x 28" Desk students have a new desire to learn. 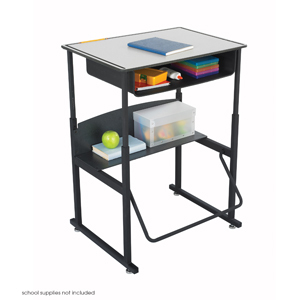 Designed for students in grades 3-12, the AlphaBetter Desk easily adjusts from 26" to 42" high to allow students the choice to stand or sit while in the classroom. With the exclusive patent-pending Pendulum Footrest Bar, students have a new way to sway! The footrest allows students to swing their feet providing extra movement to burn off excess energy. In addition it helps to correct posture. The steel frame with Black powder coat finish is built for long lasting durability. The Gray phenolic desk top will withstand the heavy use of the classroom. The steel book box stores books and supplies and a lower shelf provides additional storage space.